i love the bag – and the cat! I don’t know which is my favorite; your tutorials are great…no guessing about what to do next. Thanks Susan, I’m glad I’m keeping you busy! 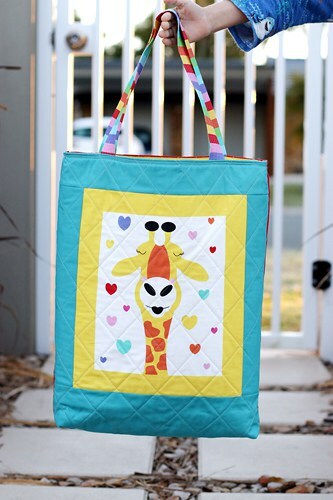 Thank you for the great tutorial on this fantastic tote bag! I look forward to making several of these for a charity I know of! I am so excited to see the whole line of fabric when it comes out. These animals are amazing and I look forward to buying several yards and making several projects with it; including your totes! Thank you for sharing and have a fantastic day! Thanks Brenda, the fabric line is super-cute and has some lovely solids and stripes as accompanying fabrics, too. Best of luck with your sewing! Wonderful bag! That would be popular for a library bag, too. For a dozen hundred kinds of things, actually! Thank you! I can attest that this bag is currently being used for soft toys, books, Lego and even some groceries the other day. We’re trying to get rid of plastic grocery bags here in Australia, so my son is happy to be the grocery carrier with his new bag whenever we pop in for a few items. Really fabulous bag. I love that the size is large. Cute kids and pretty kitty faces. Looks a bit like my daughter’s cat. He was with her for over 20 years. Oh, ye! Thanks for the tut. Thank you for the tutorial and the free PDF file. I came here from the “Quilt Block of the Month” Advent Day 15 post.